John Guest 1/2" x 1/2" Straight Ball Valve is manufactured in white polypropylene with food grade EPDM 'O' Rings for use with potable water. 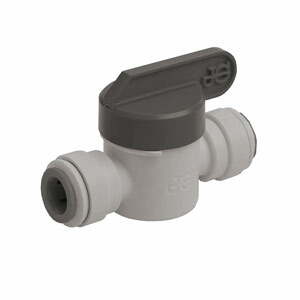 These valves are manufactured in white polypropylene with food grade EPDM 'O' Rings for use with potable water. The valves are not to be used with compressed air, explosive gases, petroleum spirits and other fuels or for heating systems.